On day 01 of your Indian Golden Triangle Tour, get greeted by the tour operator on reaching Delhi. Go on a sightseeing tour of old and New Delhi on day 02 of the Indian Golden Triangle Tour. Visit places like Jama Masjid, Red Fort, Rajghat, Humayun's Tomb, Qutab Minar, India Gate, President House, Connaught Place, Laxmi Narayan Temple etc. Overnight stay at the hotel. Drive to Agra in the morning of day 03 of India Golden Triangle Tour. Enroute visit Sikandra. On reaching Agra, check in at the hotel. Overnight stay at the hotel. After taking breakfast go on a city tour of Agra on day 04. Visit places like Taj Mahal, Agra Red Fort, Itmad-Ud-Daulah's Tomb etc. Overnight stay at the hotel. In the morning of day 05 of India Golden Triangle Tour, head for Jaipur. Enroute visit places like Fatehpur Sikri (Old Deserted town of Mughal Dynasty), the Buland Darwaza / Palace of Jodha Bai/Birbal Bhawan & Panch Mahal. On reaching Jaipur, check into the hotel. Overnight stay in the hotel. On day 06 go on a sightseeing tour of Jaipur. Visit places like City Palace, Amer Palace etc. Overnight stay at the hotel. On day 07 of the Indian Golden Triangle Tour, head for the railway station/airport for the onward journey. 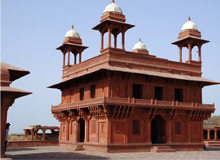 India Profile offers to give online information on India Golden Triangle Tour, India.